Retrochallenge RC2017/04 might be over, but I'm going to try and keep moving on this project. I'd already started on the pinout for the internal connectors used by the hard disk controller, and finishing that off seemed like a fairly straightforward task. Having done that, the Expansion Bus header on the back of the system was just a matter of following the same process. I started off with the hard disk controller, a multimeter, and the datasheet for the OMTI 5090 IBM PC Bus Interface controller. The datasheet has the pinout for the IC, along with a table identifying which pins were for the system bus, and which were for the system interface. For each of the system interface pins, checked for continuity to each of the pins on the header connecting to the motherboard. 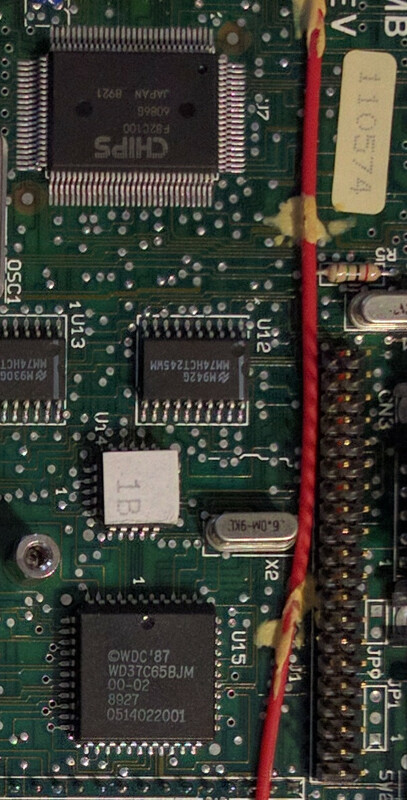 This got most of the header identified, with just a few unlabelled pins. To get those, I basically did the same thing on the motherboard, except in this case identifying the signals was more difficult. On the motherboard, many of the signals need to be buffered (or in the case of address lines, latched). For that, Victor just used 74-series logic - 74HCT244 and 74HCT373 specifically, which is well documented. I traced the signals from the connector to the appropriate buffer output, looked up the input on the datasheet, then traced the input back to the main Chips & Tech 82C100. From there I could identify the signal.